Remember that old adage that dinner parties are contagious? I’ve enjoyed it this fall handsomely, with friends throwing impromptu gatherings and potlucks each weekend. 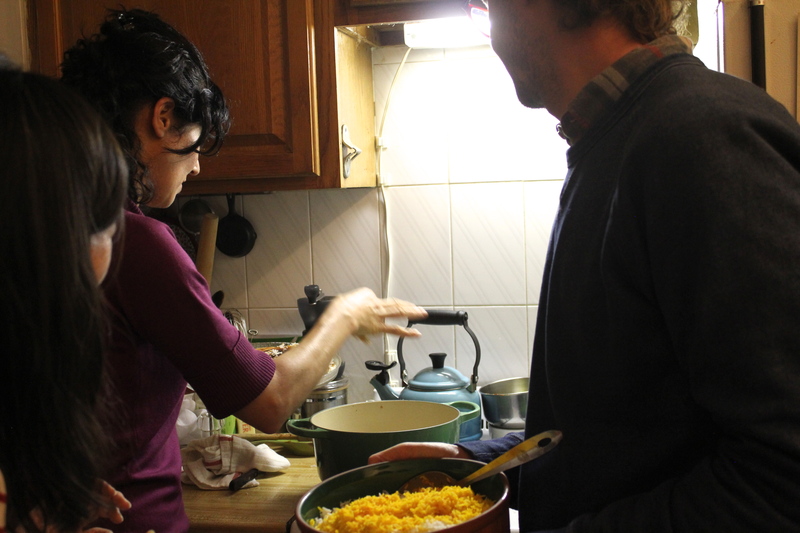 But I was really excited when Louisa Shafia, author of Lucid Food and The New Persian Kitchen, offered to demonstrate tahdig at one dinner party, on a very cold Saturday. I’ve been a longtime fan of Louisa’s smart and conscientious cooking, but never seem to get into the kitchen with her. Fortunately, my friends Dave and Karol invited her into theirs for a casual feast filled with Persian food they love recreating from recipes. This would be served with the tahdig, a classic rice dish. I love them all for letting me tag along. Walking into the small, open kitchen of Dave and Karol’s apartment, I was not only greeted with immediate warmth, but incredible smells coming from the stove. I was also delighted to find a couple more guests: Louisa’s rockstar husband James (literally and figuratively), and Lukas Volger, the best veggie burger maker on the planet. The kitchen smelled of saffron and fragrant rice already. Louisa was just about to plop in the flatbread that gets crispy at the bottom of a pot of rice for the traditional Persian dish she was making, tahdig. If that sounds like an unusual step in making rice, it is; that’s why I was really anxious to see it done in person. There are some things you just can’t get from reading recipes. 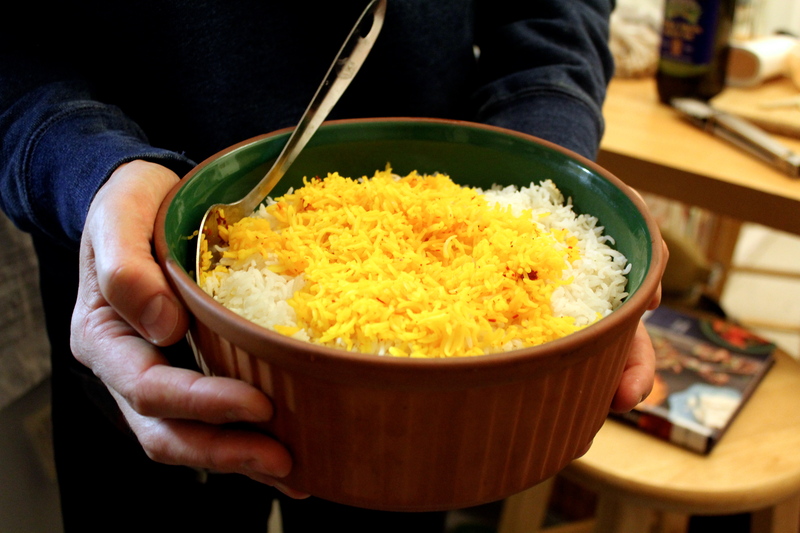 Tahdig, Louisa explained, is a simple rice dish with a bonus–that crisp, crusty piece of bread at the bottom. To begin, long-grain rice is steamed through with some butter. Once cooked, a portion of the rice is mixed with yogurt for more richness and another, stirred with saffron threads for vibrant color. It’s all piled on top of the tahdig (that’s the piece of flatbread), then steamed through again until it sticks together and gets nice and browned on the bottom. 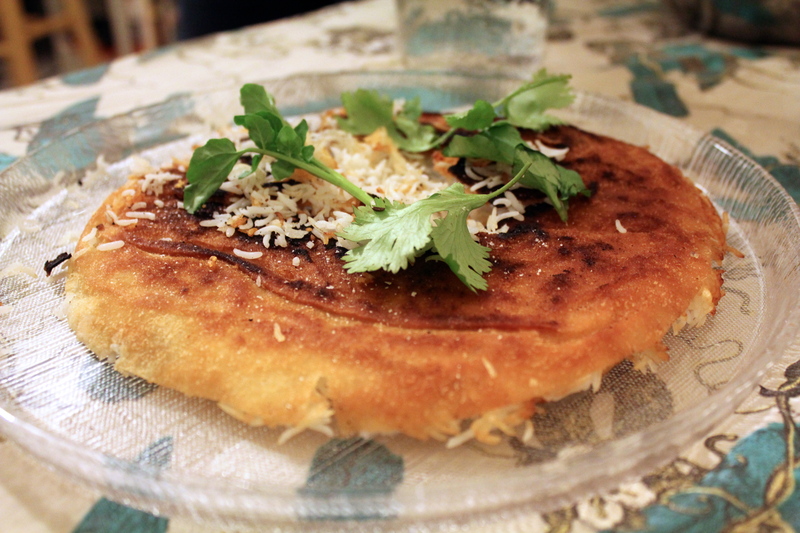 We didn’t just eat tahdig at this dinner, though. Dave and Karol presented a beautiful spread of Persian foods that they were excited to try out, like fesenjan, with its deep and savory pomegranate sauce, and sabzi khordan, a platter of feta and flatbread with lots of fresh herbs, radishes and spices. I could have eaten the latter for dinner alone. 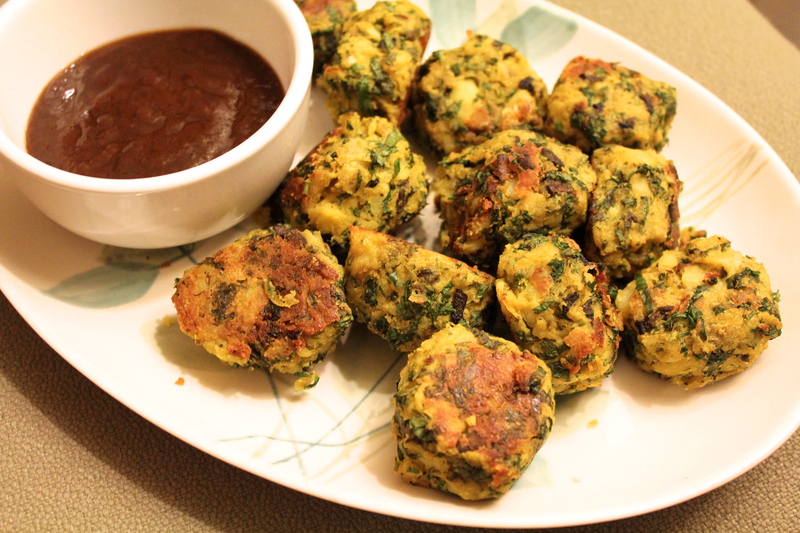 For my part, I brought an appetizer that was adapted from a recipe in Louisa’s New Persian Kitchen: potato cakes with tamarind sauce. Except I’d swapped in chopped mushrooms for the tempeh that she calls for in her vegetarian version of the dish (and learned that Louisa was also thinking of doing the same thing when writing it). The whole meal was delicious and fortunately well-received by our esteemed Persian culinary expert guest. The conversations were fascinating, too. Over the course of the night, I learned what great lengths Louisa went through to travel to Iran. Her story about that is told in this fall’s issue of Edible Brooklyn. Once the evening wrapped, after a retreat to the couches to enjoy some Karol-specialty pumpkin pie, I felt like I hadn’t badgered Louisa with enough questions. So here, read on for more! And do check out The New Persian Kitchen if your hunger was slightly piqued by this entry. I have to ask, how did tahdig originate? Was it cooks’ carelessness, letting rice cook too long and get crusty on the stove? LS: I’m guessing it just happened naturally, that the rice at the bottom of the pot would get crispy when cooked, and people found that it was delicious. If you were a good cook, you would have tahdig, and if you were a novice, you’d have burnt rice or just a flabby, wet bottom layer. Getting it perfect became an art form. LS: What a great question. The big meals with my Persian family are always buffet style, and I think people just start grabbing pieces surreptitiously once it’s put out on the table. I’m telling you, tahdig is irresistible. Did you eat this growing up? LS: Oh we definitely ate it growing up, but my dad has his own special way of making it. He makes rice with lentils, adas polo in Farsi, and he breaks up the tahdig and mixes it into the rice, so there are crunchy bits in every bite. It’s delicious! Any weird Persian-American mashups that you can recall (either from childhood or that you’ve invented)? I’m all about the mashup. One of my favorites for this time of year is “Persian” chicken soup. I make it with super tart dried limes, limoo omani in Farsi, a handful of rice, and chopped cilantro and scallions thrown in at the end. It’s a perfect marriage of my Eastern European and Iranian roots. LS: I definitely felt insecure about it. I tried to research the book in Iran, but getting the travel documentation was painstaking, and ended up taking two years. When I found out I wouldn’t be able to travel there in time to research the book, I was pretty depressed, until a friend suggested I go to Los Angeles, aka Tehrangeles, instead. It worked out beautifully, and I was lucky to have the world’s second largest Iranian community as a backup to the motherland. It was a lot easier than being in Iran where I didn’t speak the language! When the cookbook first came out, the Iranian American writer Susanne Pari interviewed me, and I confided in her about my fears of being called out for a fraud. She told me that yes, it would probably happen, but to welcome the controversy and learn to think of myself as an authority. I had spent two years researching Iranian food and culture, and had grown up with an Iranian father. She assured me that I was as much of an authority as anyone else. It was wonderful advice. You can’t live in fear of what other people think, your truth is your truth. You’ve done a lot to make Persian food more accessible, providing a detailed directory of where to buy ingredients, and giving the recipes your own “new” flair. How challenging was it to universalize the cuisine? LS: I grew up with my parents “persianizing” our food my whole life. With his high blood pressure, my father couldn’t really eat meat or processed food, so we ate a vibrant, ever changing mix of “health” food, Persian food, French cooking (my mom was obsessed with Julia Child), Ashkenazi dishes that my mom had grown up eating, and whatever interesting food trends that came down the pike. My father’s nightly comment to my mom at dinnertime, spoken in a thick Persian accent, was, “Vy don’t you put some bean in ‘dat?” And she would! We ate beans, yogurt, rice, flatbread, pistachios, fresh herbs, pomegranates, grapes, watermelons, eggplant – all the Iranian staples that we could find. But we put our own spin on everything, reducing the amount of meat, white sugar, and frying called for in traditional recipes. I’ve cooked that way my whole life, so making quinoa tahdig, tempeh kebabs, and pomegranate chicken stew with the addition of fresh beets all makes perfect sense to me. Americans are rewarded for innovating and being mavericks, which isn’t necessarily true everywhere in the world, but it applies to cooking as much as to anything else and I think it’s why there are so many vibrant food scenes popping up all over the country. In your discoveries while cooking with Persian family members and others for research, what did you fall in love with most? LS: There was so much that I loved! I learned essential techniques, like grinding saffron and steeping it in hot liquid before cooking, always browning the raw meat and raw onions together at the start of making a stew, and soaking rice in cold water to remove the starch. One of my favorite memories is of learning to make bagali polo, rice with dill and fava beans, with my cousin Mahin. We laughed a lot, despite the fact that her English is limited and my Farsi was non-existent at the time. She added a ton of fresh dill to the rice, and I was thrilled to see that she didn’t bother to remove the stems, she just sliced them very thinly. I always picture her when I make that dish. What’s your take on being a “purist” when it comes to traditional dishes? Is there anything that you’re insistent upon when cooking? LS: I don’t think of myself as a purist about anything, but sometimes someone will suggest making a change to a Persian dish and it just clangs. Recently someone asked about adding parmesan to something and I had to put the kibosh on it. What a coincidence! Both of you happen to be some of my favorite foodwriters. 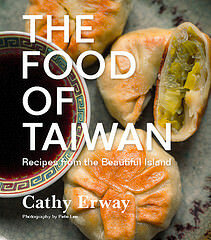 I’ve loved The Art of Eating In ever since I discovered it in my school library at 15. The stories and adventures are amazing! And The New Persian Kitchen is something I that I found out about last year, but love for the food and photography. Only way for windows 10 users to get ideas for free and learn every steps to change the setting or desktop icon with their desire one http://desktopiconswindows10.com/ thank you so much to share this very useful tutorial address.